"fiberoptikal" is a performance that includes sound, video, text, music and a little bit of dancing and screaming. It is a solo performance that deals with themes like sexual identity, contemporary virtualized life after the information revolution, a game of go, the role of images and 'opticality' in the constitution of contemporary subject - self and the Deleuze's take on Masoch: guilt, crime, second birth and modern contract. The performance includes a custom audio-visual instrument made from a GO board and optical sensors, two projection screens and a sound system. A fiber/fibre is "a class of materials that are continuous filaments, from which animal tissues or mineral substances are formed". The roots of the Western subject can be understood in the gaze of Narcissus into himself on the water surface, however, not Narcissus from the Greek myth, but the one from Caravaggio's picture, which may mark the beginnings of the painter/artist as an all-knowing, practically transcendental seer who founds truth through the image. Thus, for almost half a millenium, and especially after the invention of photography and mass media production, we construct our egos, our selves through the image. By looking at ourselves through technological and media mirrors we conceal guilt and shame, which merge into anxiety, fear and paranoia. Optical fibers, which today form the basic matter for info-media global connectivity, for a great part of world stability (bank systems, telecommunications), are like elementary particles of "opticality", perspective distortion of everyday life, false stability of the subject (and object and desire), which arise through the authority of the image. This solo performance, through video projections, cameras, sound, text, music, body, techno-artefacts and original language, takes on guilt, corporeality, gender, technology, media ... as the questioning of the crystallization and becoming of the subject. 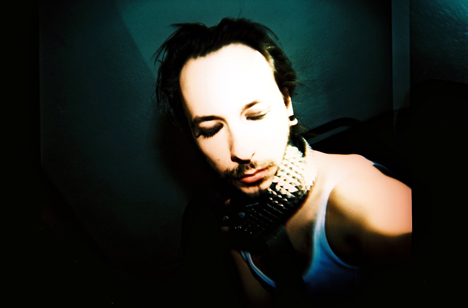 Luka Prinčič is a musician, sound designer, media artist and performer. He is the author of audio-visual and electro-acoustic performances and multimedia actions in physical and mental-emotional spaces. His work focuses on the personally reflective and socially critical use of new technologies within contemporary audio-visual contexts. Recently, his interests lie in the performative and the critical intersection of subjectivity, technology, AV-media and sound/noise/music.